“Vermeer, Rembrandt, and Hals,” a jewel of an exhibition, represents the collaboration of two gems of institutions: the Frick and the Mauritshuis, both of which showcase small but world-class collections in stately mansions. While the Mauritshuis undergoes a renovation and expansion of its home in The Hague, it has loaned a selection of seventeenth-century Dutch masterpieces for a multi-venue traveling exhibition. In addition to the masters noted in the exhibition’s title, the fifteen paintings currently at the Frick include works by Jan Steen, Gerard ter Borch, Carel Fabritius, and Jacob van Ruisdael. Hanging by itself in the Oval Room, Vermeer’s “Girl with a Pearl Earring” (c. 1665)—visiting New York for the first time since 1984—is clearly the star. (One wonders: was Vermeer a vehicle for Scarlett Johansson, or vice versa?) Restored and cleaned in the mid-1990s, its elegant geometry, evocative coloration and fetchingly candid expression are by themselves worth the trip. In the next gallery, museum-goers may recall “The Goldfinch” (1654) by Fabritius, perhaps Rembrandt’s most gifted student; it was a highlight of the Met’s 2001 “Vermeer and the School of Delft” exhibition. 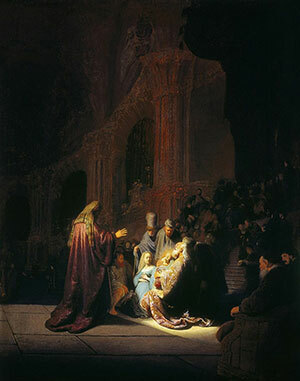 Its intimate, glowing realism is even more vibrant now, thanks to its restoration and cleaning in 2003. Most inspiring for me was Ruisdael’s “View of Haarlem with Bleaching Grounds” (c. 1670-75). Through an extraordinary combination of precise detail, largess of rhythm, and felicitous color, this painting recreates the luminous immensity of a real-life panorama. 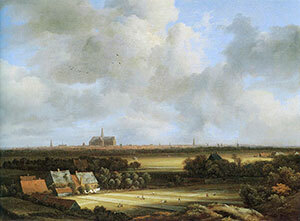 (Haarlem’s distant spires can be identified to this day.) Ruisdael somehow places careful particulars within a vast vision. Broad streams of alternately sunlit and shadowed fields, punctuated by tiny people, lead the eye rapidly and firmly to the horizon and its minute spires—all beneath an enormous sky of billowing clouds. Try fixing your eye on the miniscule staarttjasker (a small water-pumping windmill) at the canvas’ center, one-quarter of the way from the lower edge: the entire scene, in sheathes of color, unwraps above and below, in front and behind: nature, in all its self-generating exuberance. Vermeer may tug at our heart strings, and Rembrandt may stir us with his aggressive inventions, but I left the Frick thinking of Ruisdael.